In 1899, the inventor of the telephone set out to solve another problem: The airplane. He failed miserably. Really, really miserably. But this summer, a team of architects and engineers have resurrected his 106-year-old design for a flying machine for a very different purpose: As a model for floating, solar-powered structures. In the early years of the 20th century, the world's engineers were working hard to prove (or disprove) the idea of manned flight. Some argued that heavy aircraft were physically impossible, since increasing the surface area of a wing would make the craft too heavy. Others countered, with all sorts of theories about flying machines that were both light and large. Alexander Graham Bell was among them. In 1899, Bell started fiddling with a new design for an aircraft that would have a massive surface area but remain very light. He found himself completely immersed in the project ("Why, I do not know," he wrote enigmatically), arguing that proof of heavier-than-air flying machines resided in the natural world. "We are all of us interested in aerial locomotion," he said. "And I am sure that no one who has observed with attention the flight of birds can doubt for one moment the possibility of aerial flight by bodies specifically heavier than the air." Equipped with a cockpit for a passenger—who would steer using a wheel—Cygnet lifted off in 1907 carrying an intrepid pilot named Thomas Selfridge. Towed over the Atlantic by a boat, the contraption actually gained quite a bit of altitude, reaching almost 200 feet until the wind changed—bringing it rapidly downward. Though the line connecting Cygnet to the towboat was meant to be severed, it wasn't, and Selfridge was dragged through the water encased in the craft's wiry remains for several moments. He survived—but was killed the next year piloting as a passenger on the Wright Flyer. Bell, for his part, abandoned the project the same year the Wright brothers lifted off in their fixed-wing aircraft. Cygnet was a successful answer to the weight problem, but it was a failure as far as navigation was concerned. Ironically, that's the very reason Tomás Saraceno, a contemporary architect and artist, is interested in it. Saraceno, you see, is fascinated by structures that "hang" in the air (we've written about his hanging tensile structures here on Gizmodo before). 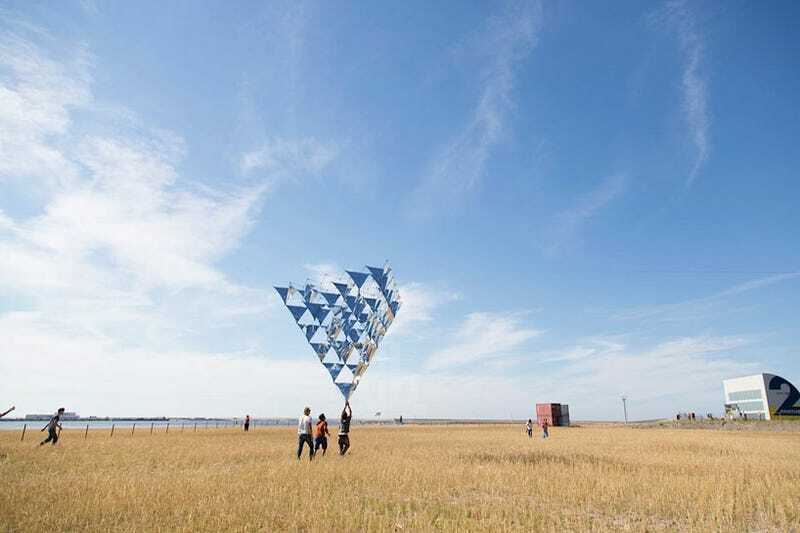 This summer, he and a team of designers from the Aerospace Engineering Faculty at Delft's Technical University have successfully replicated Bell's kite design. Except they've made a few improvements. For starters, each sail is made out of a paper-thin solar cell. And the framework itself is fabricated from carbon fiber, making it even lighter than Bell's. Unlike it, though, it's not designed to go anywhere (in fact, it's anchored to the ground), since Saraceno says it's a demonstration of how future buildings and cities could float, stationary, above the earth. That's a fairly wild concept, but that's sort of Saraceno's MO as an artist. "Play is one of the learning processes in life," he says about the Solar Bell. "It is cultivating what we do not think is possible, namely to float." Saraceno is demonstrating Solar Bell every weekend this month on an airstrip outside of Delft for interested visitors. And while it's just an experiment, he hopes to use the research in his future work. It's strange to imagine the idea that Bell abandoned in shame 110 years ago lives again—this time, as a concept for a futuristic solar-powered structure. Images of Thomas Saraceno's Solar Bell via TAAK.